In Holiday Linnunlahti, you can choose between staying in an apartment, setting up a tent or booking a space for your caravan or motorhome. The services in the area include everything from showers to saunas and from a café to a grill kiosk. To top it all, you can use our very own private gate to the Ilosaarirock festival area! Rental of Holiday Linnunlahti apartments is fixed from Thursday to Monday. Apartments can hold up to six personnel. There are 18 apartments available for rent. Each apartment has their own shower and sauna facilities. You can utilize the Linnunlahti Holiday Camping area from Wednesday to Monday, from Thursday to Monday or from Friday to Monday. The accommodation bracelets for tents can be bought only from Linnunlahti, Joensuu (the pre-sale has ended). Until 14.7. 4:00 PM, the bracelets can be bought from the reception. After that point in time, the bracelets are available at our camping area’s gate. The sooner you arrive, the better your chances to get to pick a tent site! 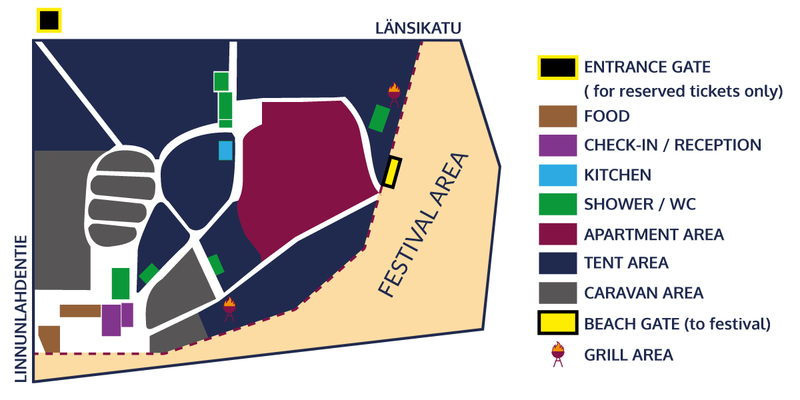 The tent area can be accessed from the crossroads of Länsikatu and Linnunlahdentie. All prices are according to the number of personnel. There are 30 caravan/motorhome sites with electricity, out of which 18 can be booked in advance. Sites with electricity are booked to start from Thursday and they must be claimed by Friday 8.00 latest. 12 caravan sites with electricity are available starting from Wednesday, 11.7.2018. These sites can only be rented from our reception, and they cannot be reserved beforehand. They are handed out with a “first come, first serve” principle. 12 non-reservable caravan spaces with electricity available on the spot starting from 12th of July – first come, first serve! Accommodate yourself and enjoy the festival! Apartments in Holiday Linnunlahti may be used by adults, underage customers require a guardian. Holiday Linnunlahti accommodates only over 12-year-olds during Ilosaarirock. Pets are forbidden during Ilosaarirock. The apartments can be checked in after 4:00 PM on Thursday and they must be checked out by Monday 11:00 AM. The camping area of Holiday Linnunlahti follows the rule of first come, first serve during Ilosaarirock – there are no reservations for a specific camping site. Our reception is open 24h during Ilosaarirock. The camping area can be entered from a gate that is located in the crossroads of Länsikatu and Linnunlahdentie. This gate can be used by pedestrians only. Accommodation bracelets are personal and they can be claimed with an ID from the gate. The online store works from 15th of February and closes on 12th of July. After the online store is closed, the bracelets can be bought directly from the reception and from the gate of Holiday Linnunlahti. Reservations regarding caravans and motorhomes can be done starting from 15th of February. There are 30 sites that are equipped with an electric outlet, out of which 18 can be reserved in advance (3 of these 18 are for buses). The sites with electrical outlets may only be reserved so that the reservation starts from Thursday and the check in must happen before Friday 8:00 AM. A site with an electrical outlet can be claimed with a confirmation email from the online store. Starting from 13th of July, there are 12 caravan sites with electricity available without a reservation from the reception of Holiday Linnunlahti.